If you want to know about How to Customize Permalinks for Blogger Posts then here is the solution of your problem. Blogger generates permalink (Permanent Link) automatically on a default pattern.But now you can customize permalinks for blogger posts. This feature is currently in blogger draft and you can get this feature from http://draft.blogger.com. Simply click on New Post and you will see the permalink option on the right side of post editor. 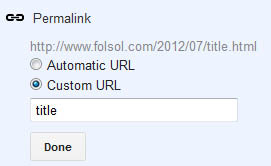 For example, if the title of your blog is "Customize Permalinks for blogger" then the blogger will generates a permalink like automatically. You can change the bold part of above URL. You can not change the entire structure of your post URL.This feature is only for your new posts, you can not edit or change permalink of your previous blog posts.